Get your flash off camera in order to create advanced lighting effects with this Godox TT685O Thinklite TTL Flash with X1T-O Trigger Kit from B&H. The flash itself is very capable with a 197' guide number at ISO 100 and 200mm and it has a built-in 2.4 GHz X wireless radio system, which is compatible with Olympus/Panasonic TTL and is designed to work with the included X1T-O trigger. This setup provides users with the ability to work at distances up to 328' and control up to five groups on one of 32 channels. With full support for Olympus/Panasonic TTL, including high-speed sync, and a built-in 2.4GHz radio system, the Godox TT685O Thinklite TTL Flash will make it easy to create both simple and elaborate lighting setups. When mounted on camera, it is an effective lighting tool with a powerful guide number of 197' at ISO 100 and 200mm, a zoom range of 20-200mm, and the ability to tilt from -7 to 90° and rotate 360°. As a TTL-capable unit, the TT685O can also operate as a full wireless master or slave unit with TTL functionality. Operation is intuitive with a rear LCD panel that shows settings. Also, the flash is equipped with a Wireless Control Port for attaching an optional remote control set and it has a 3.5mm sync port for basic wired connectivity. It runs on four AA batteries, which help provide a recycle time of 0.1-2.6 seconds. An integrated 2.4GHz X radio system is incorporated into the TT685O for wireless triggering. Able to be set up as a master or slave, this flash will help you create a versatile lighting setup with a range of 328' and support for 32 channels and three groups. It can also work with an optional X series transmitter for creating more elaborate setups. With a guide number of 197' at ISO 100 and 200mm the TT685O will easily illuminate most subjects. It also features a zoom head with a range of 20-200mm and a 14mm wide-angle panel for using a variety of different lenses. The flash head can be tilted from -7 to 90° and rotated a total of 360° for controlling bounce and where the light falls on the scene. Optical master/slave transmission is available for working with other standard flashes. Using an optional FT series remote control set, users can connect to the wireless control port to gain wireless control over the flash's power settings. This flash runs on four alkaline or NiMH AA batteries which help deliver about 230 full-power flashes and recycle times of 0.1-2.6 seconds. Enjoy TTL-enabled and reliable wireless flash by picking up the X1T-O TTL Wireless Flash Trigger Transmitter from Godox. This 2.4 GHz X wireless system is compatible with Olympus/Panasonic cameras and flashes that support TTL for automatic exposure and metering, making it an excellent choice for shooters who need to work quickly. It also has an outstanding range of 328' and can be set to one of 32 channels for limiting interference with other nearby systems. Another huge benefit is the ability to control up to five groups at a time, or set the unit to ratio flash mode for three groups with varying power relative to one another. Users will have access to many settings through the backlit LCD and can make adjustments to settings such as sync delay and triggering modes. Also, through TTL compatibility the system will support high-speed sync, flash exposure compensation, and flash exposure lock, among other settings. 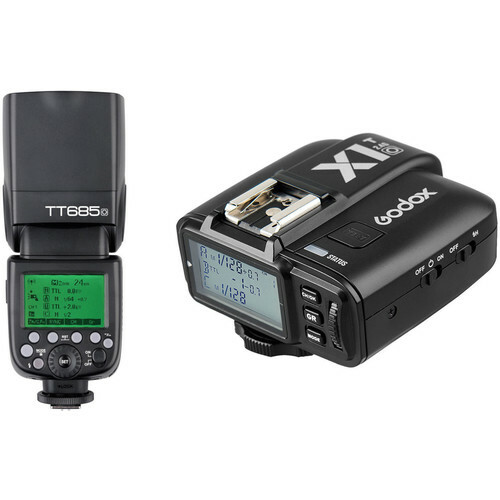 Beyond this, users will be able to easily mount their flash to the transmitter's top hot shoe, or you can connect a studio strobe via the PC sync terminal on the receiver or PC sync terminal on the transmitter. Additionally, it runs on two AA batteries and has a micro-USB port for firmware updates. Box Dimensions (LxWxH) 7.9 x 3.6 x 3.2"
Box Dimensions (LxWxH) 4.4 x 4.3 x 2.2"
TT685O Thinklite TTL Flash with X1T-O Trigger Kit for Olympus/Panasonic Cameras is rated 4.6 out of 5 by 9. Rated 2 out of 5 by Ben from Wireless Trigger Works With Panasonic BUT NOT Olympus Olympus buyers beware. I have two Panasonic cameras and two Olympus cameras. The wireless trigger only works with the Panasonic cameras, but not the Olympus ones. To be fair, the flash unit on its own is not bad though. Quite powerful and the built quality is good for the price. As a hotshoe mounted flash, it works on all 4 of my cameras. TTL output seems to be accurate. The firmware update program that I downloaded from the Godox official website only worked after I had anti-virus uninstalled. Godox even tells you in the instruction to turn anti-virus off. Overall, I would give the flash unit itself a 4 stars. But as a package with the wireless trigger, I can only give it two stars because it doesn't work with Olympus cameras. Rated 5 out of 5 by richard from Excellent product, great price I purchased the Godox TT685o and X1T-o combo because I was frustrated with the optical signaling of the Olympus system. I had looked into radio TTL but few supported Olympus and all were frightfully expensive. My thinking was that if the TT685o were any good at all I would buy more. When it arrived I was pleased with the quality feel and finish. It is about the same size and power as a large Olympus flash as a fraction of the price. Functionally, the TT685o/X1T-o combination is able to do anything I require in off camera flash, straight line flash, around corners, outdoors, or in rooms with ceilings that absorb the optical signals. The X1T-o controller responds to all of the camera setting for flash compensation, first curtain, second curtain and red-eye. High speed sync is selected with a switch on the controller and works to 1/8000 of a second. The surprise is how well the TT685o worked on camera. Other than optical RC it supports every function of an Olympus dedicated flash.. It is also easier to set up than the Olympus flashes due to the multiple buttons. There are only two minor issues: The auto-zoom function does not turn back on after the flash has been used off camera, and when the auto-zoom is working it does not quite match the focal length of the lens. The first issue is fixed by using the reset function of the flash. The second did not appear to make any significant difference in actual use. I liked the TT685o well enough to order two more and put my aging FL-50R flashes up for sale. Rated 5 out of 5 by Mike from Godox TT685O on Panasonic Seems to work very well on my G85.? TTL exposure was right on target.? Build quality seems good as well.? Very pleased with the flash. Rated 5 out of 5 by Anon from Works well with Olympus EPL7 Easy to use, images are clear. Rated 5 out of 5 by D.Wilkins from It works perfectly for Olympus OMD EM-1 Mkii This flash is well built, as good as my Nikon flashes. The menu is simple and well laid out. ?The "on/off" switch is far better then the Nikon and the price is far better then the Olympus flash. ?But the best news for this flash is it provides high speed sync up to 1/8000 sec right out of the box. A single button on the back of the flash turns on HSS and nothing needs to be done in the Olympus menu. ?All flash functions work as stated by Godox. Rated 4 out of 5 by Kin C. from No AF-Assist Light Everything works great!! Easy to use and easy to set up. Build quality is surprisingly good for the price. Have to take off one star though because this m4/3 version lacks the AF-assist light, whereas the Nikon version has it. Rated 5 out of 5 by william from Just what I needed I got this recently.? It gives me a powerful, easy to use off camera flash at a very reasonable cost.? I plan to add an additional slave unit. Will it work on the e-m10iii? Yes, this flash will work on the new Em10iii. Will it work on the g9? I don't have an em10 but I have an older camera than that...the E-PL5, and it works with that... I would be pretty confident that it works with the em10.